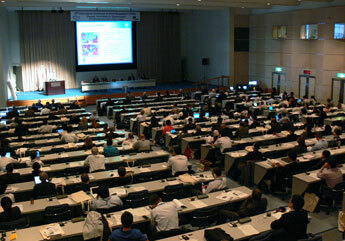 On 27-29 September 2011, the 5th International Conference on Flood Management (ICFM5) was held in Tokyo, Japan with more than 450 participants gathered from 41 different nations throughout the world. Following three days of extensive discussions on the important issues that communities, nations and regions face in flood management, the participants of ICFM5 declare the following as their own commitment, and appeal to all of the professionals, managers and decision makers in this important field as well as the public to carry out such statements for life security, social welfare, and enhancement of land and water related environmental management. Please click here to continue reading the Declaration or download it from the following link in PDF format. ICHARM, ICFM5 Secretariat organized the 5th International Conference on Flood Management in Tokyo from 27 to 29 September. More than 450 participants from 41 different nations participated in the conference. The call for abstracts and on-line registration found an unexpected success. The ICFM5 Secretariat received 417 abstracts covering all the announced topic areas. More than 250 participants traveled to Tokyo from outside of Japan to join about 200 other participants who came from across Japan to attend the conference. 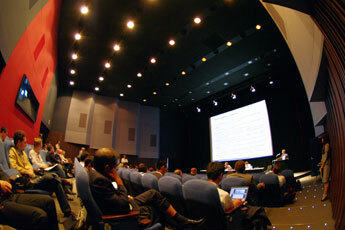 The International Scientific Committee reviewed all submitted abstracts for relevance to the ICFM5 objectives. In total, 256 presentations were delivered during the 3-day conference at various opportunities including plenary sessions, special sessions, oral parallel and poster sessions. A few high-level experts were also invited to make presentations at the International Forum on Mega-Water Disaster in the first day of ICFM5. The ICFM5 started its first day on 27 September at the United Nations University (UNU) in Tokyo with the welcome address and opening remark by Prof. Kuniyoshi Takeuchi, director of ICHARM. Mr. Michel Jarraud (WMO Secretary General), Prof. Soon-tak Lee (UNESCO-IHP chair), Prof. Kazuhiko Takeuchi (UNU Vice-Rector) and Prof. Slobodan Simonovic (ICFM Ad-hoc Committee Chair) also spoke at the opening ceremony. In addition to two plenary sessions on "Flood Forecasting and Early Warning Systems" and "Floods, Landslides and Debris Flows due to Torrential Downpours", the International Forum on Mega Water Disasters was held by MLIT and other governmental organizations in conjunction with ICFM5 in the afternoon of the first day. The main objective of the forum was to incorporate recent experiences and lessons learned from the Great East Japan Earthquake and Tsunami to ICFM5. Sessions of high-level experts and decision makers were convened and their discussions were reflected during the conference. His Imperial Highness Crown Prince of Japan and a few other high-ranking officials including Mr. Mir Changez Khan Jamali, the minister of the Science and Technology of Pakistan, and Mr. Rogelio Singson, the secretary of the Philippine Department of Public Works and Highways (DPHW), took part in the event. The second and third days of ICFM5 were dedicated to special, parallel and poster/exhibition sessions. All participants received a book of abstract proceedings containing more than 300 accepted abstracts in both hard copy and digital form. A copy of the first ICHARM book series on "Large-scale Flood reports" as a contribution to the International Flood Initiative was also distributed to all participants. The conference ended on 29 September after reading the draft of the ICFM5 declaration and announcing Brazil as the host of ICFM6. About 40 participants joined two technical tours for flood risk management to visit Arakawa and Tsurumi river. About 20 participants also joined a cultural tour of Tokyo. Increasing Complexity of Socio-Economic Systems that the components of socio-economic activities are increasingly dependent upon each other and the impact of local disasters may quickly extend to national, regional and global scales through the market network (e.g., supply chains). Floods are the most extensive and frequently occurring disaster in the world, resulting in the largest socio-economic impacts to most nations in comparison to all other natural disasters. Climate change is a serious factor that acts to increase the flood risk. The intensity and frequency of torrential rains have markedly increased, as evidenced in Taiwan in 2009 and in Japan in 2011. Implementation of HLEP/UNSGAB Action Plan. HLEP/UNSGAB's Action Plan on Water and Disaster is unique in its commitment to implementation. The national and international organizations that participated in this Conference should make strong commitments to the important items discussed during ICFM5, including early warning systems, preparedness indices, climate change adaptation and mega-delta protection. Spreading the Word. The participants agree to distribute this statement at other key related international events, such as the 1st Integrated Research on Disaster Risk Conference (Beijing, 2011), the 6th World Water Forum (Marseilles, 2012), Rio+20 (Rio de Janeiro, 2012) and the 3rd World Conference on Disaster Reduction (Japan, 2015). Sharing Knowledge and Experience. Information sharing on the local, regional, national and international scales is an essential element of the flood risk management process. Training and Education. The participants recognize the need to promote training and education related to the field of integrated flood management. PowerPoint files (in PDF or PPS format) of all oral/poster presentations except a few with no permission from the speakers to do so. Selected full paper publications from 120 submitted manuscript in the Journal of Flood Risk Management and IAHS Red Book Series by the mid 2012. We are in the process of sending them to the ICFM5 International Technical Committee for the first round of review. We will contact authors with a manuscript accepted for the second round of review by the late 2011 or early 2012 (about 60 manuscripts are scheduled to be selected for the second review). Unsuccessful manuscripts from the first review will be sent back to their authors in due course. ICHARM would like to extend its deep gratitude and appreciation to the ICFM5 participants for the faith they had in us and tangible contribution to the success of the conference. We hope it was a fruitful conference for all of you. Please feel free to send us your comments or inquiries to the ICFM5 Secretariat at ICHARM. International Conference on Flood Management (ICFM) is the only recurring international conference wholly focused on flood related issues. It is designed to bring together practitioners and researchers alike, including engineers, planners, health specialists, disaster managers, decision makers, and policy makers engaged in various aspects of floodplain management. It provides a unique opportunity for these various specialists to come together to exchange ideas and experiences.